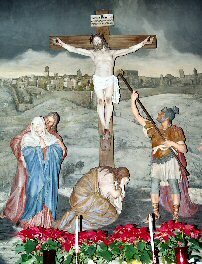 sacrifice to God the Father. are distributed to mankind. Everyone is called to be a saint. No one is excluded. The condition of holiness and sanctity consists in love, for we are told by St. John that God is love. God is not a hateful God or an avenging God, for he neither delights in our suffering, nor desires our death. God desires us to make as our own; his attitudes, his thoughts, his conduct. All are included in His desire to unite us to Himself. As a model for us to follow, He has given us His son, Jesus Christ, as a human expression of this love. Born of Mary in all ways like us but without sin, Jesus exemplifies for us a life of holiness and charity based love. By living His example we become perfected and obey His command to be perfect as His Father is perfect. Saintly holiness is as varied as the faces of each person who has ever lived, is now living, and will live in the future. All are invited to be led, some by their visible heroism, others through their everyday goodness to express the gift of Faith in their love for God. Again, everyone is called to holiness. Those who are presently in heaven, enjoying the loving presence of God are all saints, whether identified by the Church for the heroic public examples of their lives, or by their day to day lives of caring for the welfare of others; they have all cooperated with God's grace to express their love for Him. So. . . who, pictured on the Home Page picture is a saint? 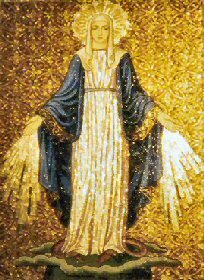 It is a dogma of Faith held by the Catholic Church that Mary who always enjoyed the fullness of God's life in her soul, was created sinless and is venerated in heaven as the Mother of God and Queen of All Saints. Her husband, Joseph, the foster-father of Jesus, while born marked by Adam and Eve's original sin, by his life, exemplified a full cooperation with God's grace. His life was one of commitment to care for Mary and her child, Jesus, the God-man. Joseph is invoked as the patron of a happy death because in his last days, he was cared for by Mary and Jesus. The Bible refers to Joseph as a, "just man," who strove to implement the use of God's love in his dealings with others. What of the shepherds called from the fields by the angels to adore their savior? Do we know? No. What we do know is they were favored with a divine invitation and Mary's smile to see the long-awaited Messiah with their own eyes, to touch Him if they chose, to believe the heavenly message that they were invited to see their king. More than likely they wait in heaven to tell us of what they saw on that Christmas day. 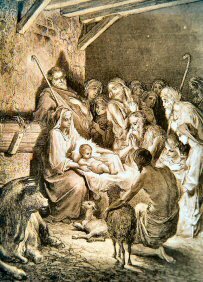 What was expected of the shepherds is the same as is expected of us today, namely: practice everyday goodness, be open to the promptings by the Holy Spirit to increase in holiness and charitable love for our neighbor. Still greater fullness in the life of God comes from responsible membership in Christ's Church and reception of its sacraments. Cooperation with God's grace will transform us in ways beyond our imaginings. To learn more, please select a link, below.